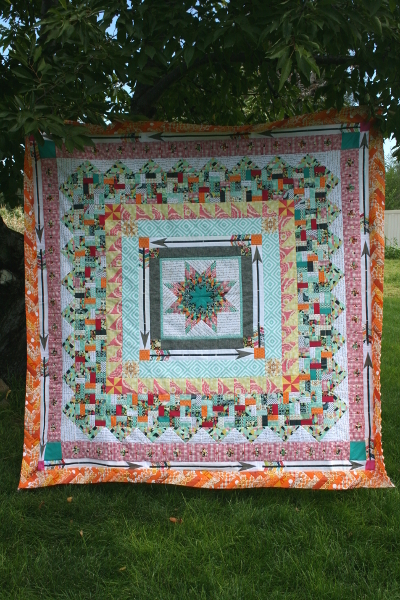 I’ve added two more borders to my medallion quilt. I made twelve paper pieced arrows for border #8. The measurements worked out perfectly this time. I didn’t have to shorten the shafts of the arrows and had enough room for a 1 inch space between them. I auditioned a ridiculous number of prints for the corner posts on this border before realizing that I needed a solid. Everything else competed with the prints on the arrow, so a bright pink was chosen. 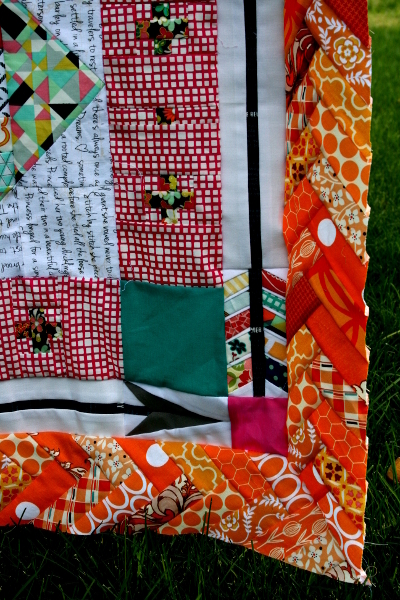 The ninth border is a braid or herringbone pattern made up of dozens of little strips of orange fabrics. It’s not what I originally planned color-wise but I like it. Nothing is laying flat on these borders because I haven’t sat down to remove the paper from all of them. (Any suggestions for quick but gentle removing of paper from paper pieced blocks is most welcome!) Regardless, I’m happy with these borders and had fun making them. 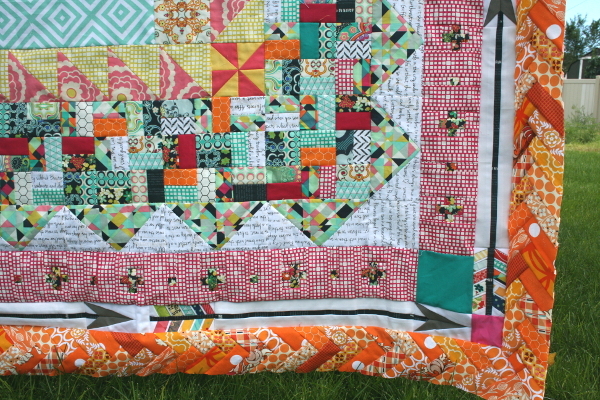 I have decided to add two more borders to this quilt and then call it finished. Right now it measures 72 inches square. I’d like to finish this before Saturday. Wish me luck! Ooooh! I live the orange herringbone! Wow Jennifer what a lovely addition. Love to know where you got the paper piecing for that arrows? Your quilt top is amazing! Can’t wait to see it finished! Wow it is beautiful! 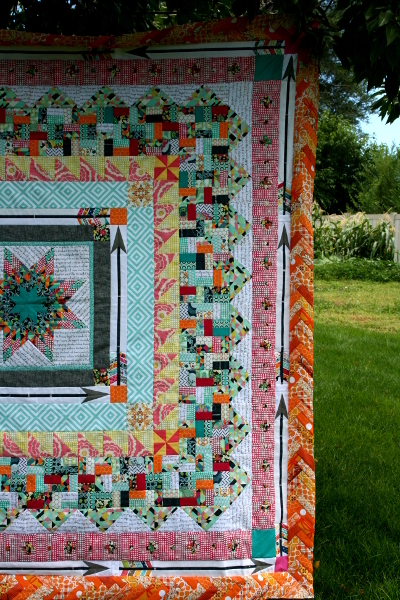 Love the arrows, and that second orange border works really well with the quilt! 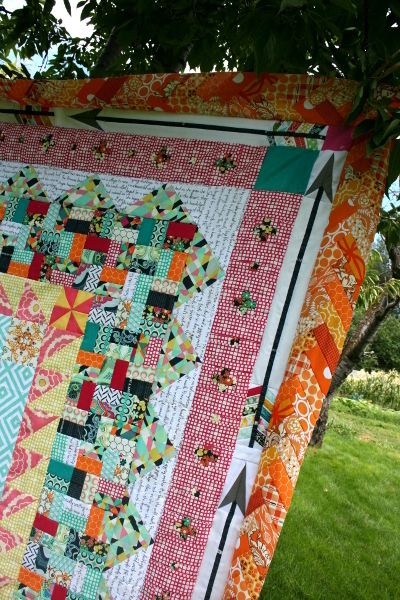 This quilt gets better and better with each round. I love the way the orange braid makes the orange corner squares from the earlier round pop. Beautiful!